Has it really been a month since I last posted? And after such a big post, too? Thank you all so much for your lovely comments, I’m happier than I can express. Apologies for the long gap between writing – I’ve been struck down with one of the nastier colds I’ve had, exacerbated by a very busy month at work. I’m definitely on the road to recovery though, and looking forward to getting back into the swing of life. Can you believe how close we are to Christmas? I can’t. I think it’s probably partly due to the weather – we’ve just had the coldest Spring in 13 years, so it’s hard to imagine that Christmas is just a few weeks away. It does mean I’m getting a little bit more wear out of my trans-seasonal pieces though, including this pretty midi dress from Scarlett & Jo. 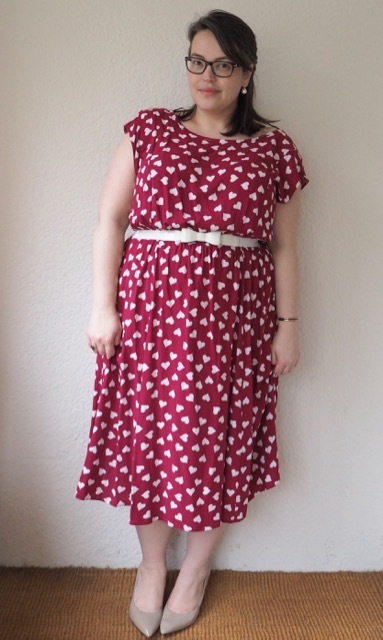 I bought it in a size down from the Lollidot dress that I bought earlier in the year, and it sees to fit my slopey shoulders a little better. 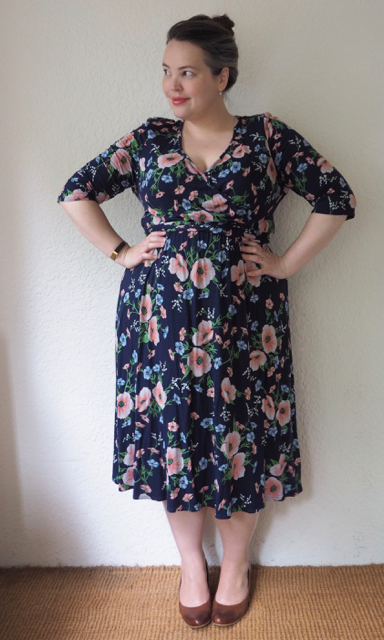 It’s a mock wrap dress with a surplice crossover bodice and elasticized waist. The waist ties with an attached sash that’s probably a little unnecessary, and prevents me from wearing the dress with a belt, but it would be great for cinching the waist in if you’ve bought a size too large. It’s made of a super soft jersey that wears well during the day, and the gorgeous navy floral print holds its colour well over repeated washes. 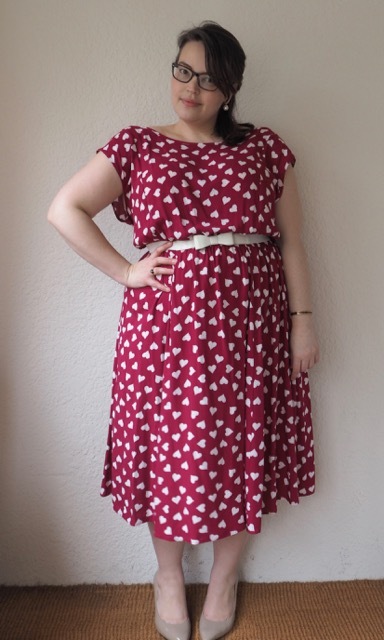 The dress has little attached shoulder pads, the same as the Lollidot dress, which helps to give it a very 40’s silhouette. 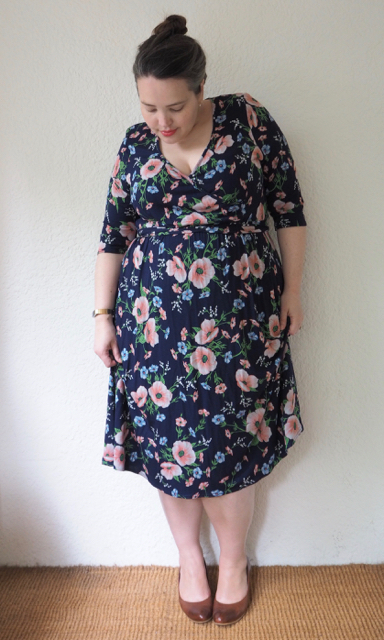 You can see here that I made a tiny little stitch at the crossover point – with my full bust wrap dresses can be a bit fraught, and a little pin or stitch just helps me feel a bit more confident that I’m not flashing too much cleavage up and down the street! Because the dress is pull on – not a true wrap – a few stitches with needle and thread are enough to keep it closed permanently. This is a great dress for those inbetweeny months where it’s neither hot nor cold, and it looks just as elegant with tights and a cardigan. 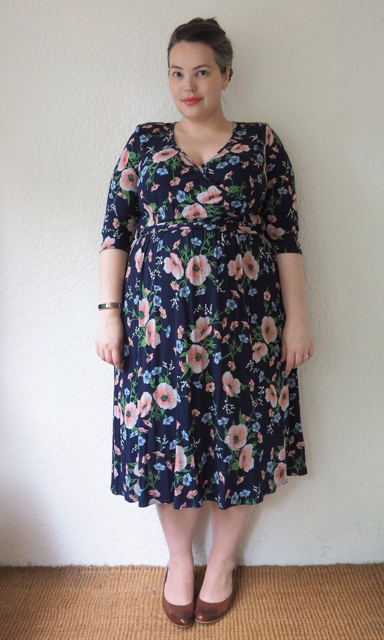 It would be a great one to take on holiday as a back-up going out frock, as it rolls up very small, doesn’t crush, and is wonderfully comfortable. If you decide to order, don’t forget to sign up to receive 15% off your first order, and make sure you check out the clearance section; one of the best parts about shopping from Australia is that you get to buy all the summer stuff at sale prices and wear it straight away – hopefully by the time it arrives it might even be hot! 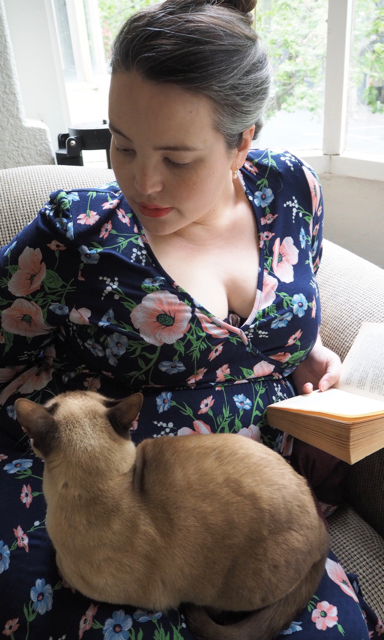 I bought this dress a month or so ago, but it’s only just starting to get warm enough to wear it (almost – you can see that I’m still employing my trusty cardigans). 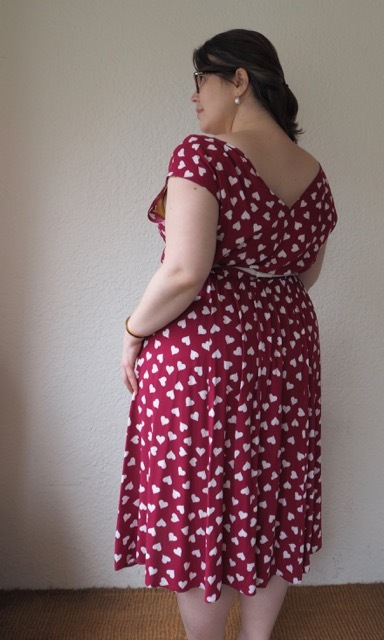 I spotted it on Allyasphyxia on Instagram and knew immediately that I had to add it to my wardrobe: midi-length, elasticised waist, dropped shoulders, and a heart print fabric? Swoon. 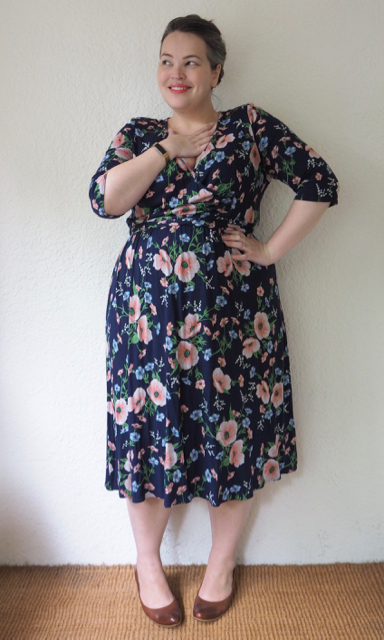 I followed the size chart, and bought the size 18, which is fairly roomy in both bust and hip; with all the stretch at the waist I probably could have comfortably gone down a size, but I don’t mind the blousy draped effect of the larger size. The shoulders are bulked up a little with floppy little shoulder pads that I probably could have done without, and after wearing it today I’m thinking I might add some bra-strap keepers because the deep v back (which I love) does mean it slips around little. 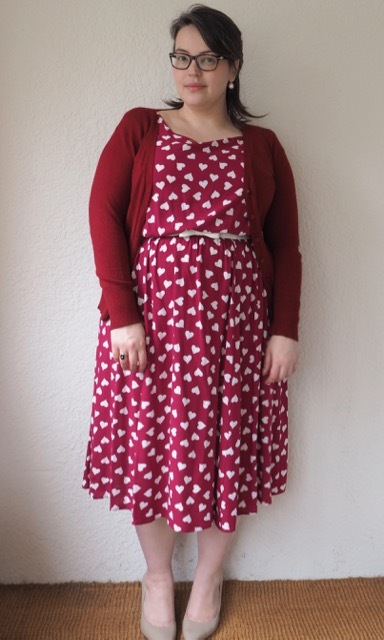 Yours Clothing calls the colour of the version I bought “pink”, Scarlett and Jo is probably a bit closer to the mark with “burgundy” – it’s a gorgeously rich, deep red. 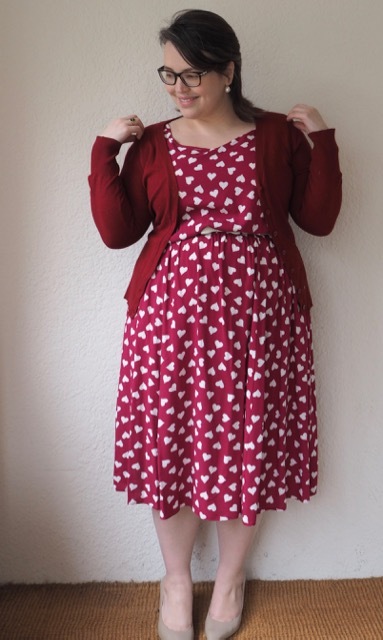 A pinky red, but definitely what I’d call red (especially with a red cardigan on top). 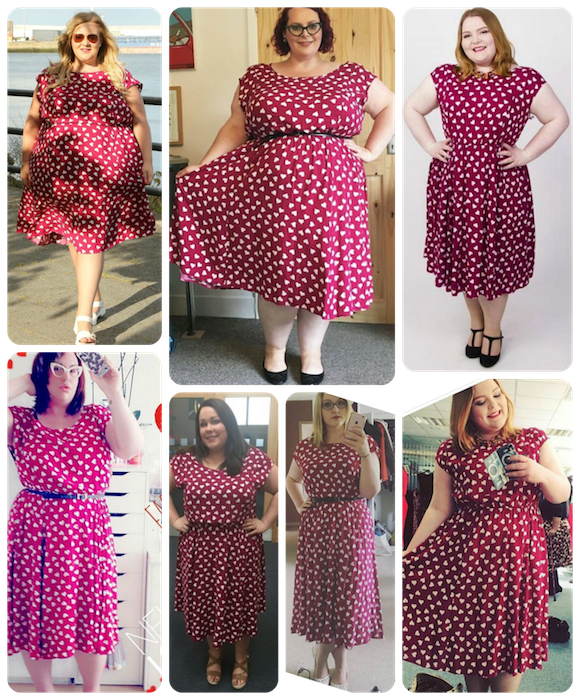 That’s What Laura Loves in the top left and Lolly Likes Fatshion in the top middle. Please accept my apologies if I’ve missed any other bloggers, and feel free to leave a comment with the details if you recognise the other models and I’ll update the post!